Donna Jordan from Jordan Fabrics is back again with another unforgettable tutorial, this time for one she calls “Paper Lanterns.” It’s absolutely stunning and so easy to make. It’s not hard to see the resemblance between this quilt and the beautiful paper lanterns that light up night skies and dark rooms alike. All of the same beauty, just in a quilt! This baby is super simple to make, especially if you got ahold of the written pattern along with Donna’s video tutorial. You can get that by clicking here. Now that you’ve got the written pattern, let’s get started on making the quilt. Each block looks like a little lantern, and it’s super easy to make. Each block is two identical sections. They kind of look like slightly rounded triangles, but they’re simply triangles with trimmed corners, surrounded by background fabric, forming smaller triangles. Trust me, it sounds a lot more complicated than it actually is. 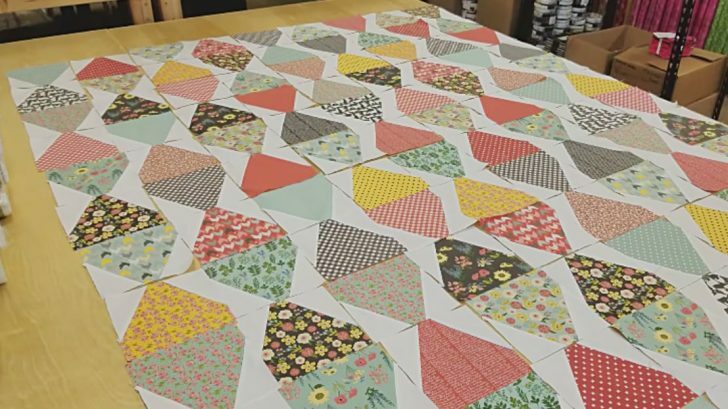 You’ll start by cutting rectangular pieces of background fabric for your little triangles. You’ll cut those along the diagonal to form two triangles. Then, you’ll put this over a larger rectangle of patterned fabric, using it to create the trimmed triangle shape. Sew and trim off the excess corners, and you’re good to go on half your block. Sew the block together by facing the two rectangles to one another, then you’ve got your lantern. Then put together all of the blocks with your batting, backing, and any borders, and you’re done. Watch Donna’s tutorial below for more tips and tricks. Happy quilting!